Can we survive without chickens? Chickens, or more accurately Gallus domesticus (I call them chooks), are everywhere – just about. Andrew Lawler contemplates A world without chickens (paywalled). The short answer is that we’d struggle to survive. There are 22 billion chooks in the world. They supply almost 100 million tonnes of meat each year, close to a third of all the meat we eat. In addition we gobble down over one trillion eggs every year. Apart from that the world uses 400 million doses of flu vaccine each year. The serum is reproduced in fertilised chook eggs. It is estimated that without the vaccine 50,000 more Americans would die each year. Replacing chicken with beef would require eight times as much feed and ten times the land – more than India and China combined. Or we could double the number of pigs. Pigs require only 14% more feed to produce the same amount of meat. No other bird will do. Neither ducks nor turkeys produce meat or eggs as efficiently as chooks. Ducks need water. And they are not as adaptable. “You don’t find ducks in semi-desert subsisting on vermin” says one expert. Lamb produces over five times as much greenhouse gas as chicken, beef nearly four times. Turning to pork would increase greenhouse gases by 75% for the same meat. But switching to beans would reduce emissions to less than a third. Chicken generally is becoming more popular. As recently as 1950 Americans ate twice as much red meat as chicken. Today that situation is reversed. In China chicken is about to surpass pork in popularity. Some 3000 years ago, Polynesians took chickens with them on their expeditions to settle Pacific islands, using their bones to make sewing needles, tattooing implements and even musical instruments. Ancient Greeks considered the bird sacred to their god of healing, and believed its parts could cure illnesses ranging from burns to bed-wetting. Roman generals kept a flock of chickens on hand before battles for military advice. If the sacred birds ate heartily before the conflict began, then the generals could expect victory; if they turned up their beaks, then best to retreat. And cockfighting is probably the oldest spectator sport after boxing. Lawler reports that Darwin spent a good deal of time and money studying the bird. Darwin deduced that all varieties of domestic chicken descended from the red jungle fowl, a shy and elusive pheasant that lives across south Asia and parts of China, and is adapted to a variety of habitats. 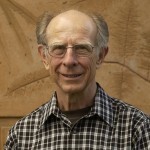 His conclusions were confirmed in 2004, when the bird’s genome was sequenced. This source suggests that first domestication may have occurred in Thailand 8,000 years ago, or perhaps there were multiple origins in distinct areas of South and Southeast Asia, including North and South China, Thailand, Burma and India. The above photo shows a red junglefowl (Gallus gallus). Domesticated chickens appear at Mohenjo-Daro in the Indus Valley by about 2000 BC and, from there the chicken spread into Europe and Africa. In modern times we treat chooks abominably, by and large. They have short and miserable lives and are often consumed in ways that are not particularly good for us. There still seems to be some confusion about what such terms as “free range” and “organic” mean. If memory serves, I heard discussion on the radio about ‘free range’ being claimed where stocking density was up to 25,000 birds per hectare. This 2011 article claims that in Australia there is no single standard for organic or free range products and anyone can use those terms. Here is a sustainable table for free range chickens and eggs. Europe has a formal standard whereby single eggs must be individually marked with a number to indicate one of four categories: Organic (ecological), Free Range, Barn, or Cages. Stocking density is limited to 2500 hens per hectare or one hen per 4m2. Britain has the largest free range flock, but standards are not always followed in practice. Some retailers – such as Waitrose, Sainsbury’s, the Co-op and Marks & Spencer – no longer sell eggs from cage birds. The article points out that under EU regulations free range allows up to nine hens to be crammed into every square metre of floor space when in the shed. Finally, being Easter I’ll mention that when I was very young growing up in a settlement of German farmers there was no such thing as an Easter bunny or candy and chocolate Easter eggs. We had boiled eggs with coloured dye on the shells, fondly remembered. That depends upon which goes first, the chicken or the egg! 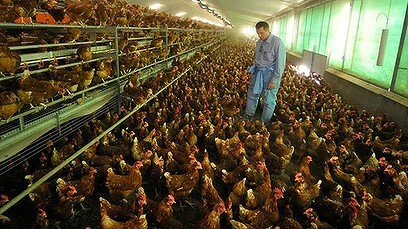 Brian: The quick answer is yes, we can live without chooks. In the long term, I would expect edible insects to become a more important source of animal protein than chooks. Insects require less water and food to produce protein than most of the animal alternatives and are particularly suited to the role of converting waste to food. It is also worth keeping in mind that chooks only look better than beef if you are comparing grain fed animals. For example, kangaroos living on natural vegetation in arid areas would have a very competitive footprint. I spent part of my life growing up on a poultry farm. We had layers who lived in a barn with an outside yard as well as meat producers who lived in small cages. We need to be careful that we are seeing things through chooks eyes when deciding what is best for chooks. For example, the way we farmed layers sounds good but it had a number of problems. Firstly, “pecking order” could be gruesome at times when chooks were kept in large flocks. Every so often we would find a live chook that had been pecked to the point where their guts were lying on the ground. (Never happened in a small cage.) 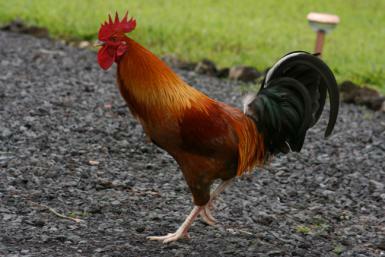 In addition, many of the traditional predators of jungle fowl attacked from above. Being in an open yard would have been stressful at times even when there was not a hawk flying above. I posted about insects for food at LP. See Fried flies, please! So, yes, they’d be a starter. Chickens go from egg to pot in a matter of months or weeks. I’d be fairly sure kangaroos would be comparatively inefficient at producing meat, although their method of locomotion is said to be the most efficient of any animal. Chickens do go from egg to pot within weeks. However, commercial chicken farming uses grains as feed. There are plenty of other sources of animal protein that don’t use chicken feed that people could eat directly. Some of these like rabbits breed up very quickly when the opportunity is there.